It all started with Rod Dixon’s KiDSMARATHON. When Rod visited for the annual Litchfield Hills Road Race, he saw the perfect opportunity to bring his great program to our area. KiDSMARATHON CT began in June of 2007 with a kids-runners clinic, sponsored by Litchfield’s Parks & Recreation Department, as part of the annual Litchfield Hills Road Race activities. The program was formally launched in 2008 with kids participating from Litchfield and other local public schools. KiDSMARATHON CT was piloted and later expanded statewide in 2010, 0ffered by the Connecticut Association of Schools (CAS) to 1,000 public and parochial-member schools (for kids ages 7 through 12). Each year, the goal is to have thousands of KiDSMARATHONers complete the program, with the mantra of FINISHING IS WINNING, WINNING IS FINISHING! Kids complete their marathon experience in grand fashion, by running the last mile in front of cheering family and friends. Imagine the feeling! It is a great finale to the program, and the kids receive the recognition they deserve as well as a fantastic memory. Expectations realized! The journey continues. 45 schools across the state joined in on the annual KiDSMARATHON CT movement! They completed their final 1.2 miles of the 26.2 mile marathon distance at five-regional tracks in Cheshire, Danbury, Norwich, Fairfield and Litchfield. Breakthrough participation! Initiation of a YMCA-mentored after-school KiDSMARATHON program, engaging 60 kids from Torrington Public Schools. We made it statewide! The first statewide KiDSMARATHON CT was guided by the Connecticut Association of Schools (CAS) and sponsored by ANTHEM Blue Cross & Blue Shield, SODEXO Food Service and Litchfield Hills Food Systems, kicked off with nearly 1,000 kids who completed their final mile at three regional sites. A measure of sustainable success was achieved by 2009 pilot-test schools repeating the experience with higher student participation across the board! Final Mile Celebration! The KiDSMARATHON Final Mile Celebration was born, held at the Southington High School, as part of a regional pilot test among 23 elementary grade-level schools. More than 250 kids participated, with all kids, teachers and school administrators giving the program their enthusiastic thumbs up! A total of 71 kids became KiDSMARATHON pioneers by accumulating 25 miles in training and completing their final mile as part of the famous Litchfield Hills Road Race in June. A KiDSMARATHON mentor program was launched by the Litchfield High School track & field team. Rod Dixon and the high-school mentors ran the final mile with the kids, after which Rod presented all the participants with KiDSMARATHON pioneer medals, recognition certificates and a commemorative print of Rod’s winning finish (2:08) at the 1983 New York Marathon! Rod’s good friend, Brent Hawkins, Director of Litchfield’s Parks & Rec, organized the first KiDSMARATHON Runners Clinic. From the enthusiastic response of kids and parents alike, a leap of faith led to the restaging of Rod Dixon’s KiDSMARATHON™ program to fit in with public-school curriculum priorities and help in kids’ experiential learning of life skills to prevent childhood obesity. At the New York City Marathon in 1983, I had just won the greatest run of my life: I was the very first person from the start line at the Verrazano Bridge on Staten Island to arrive at the finish line in Central Park, New York City. 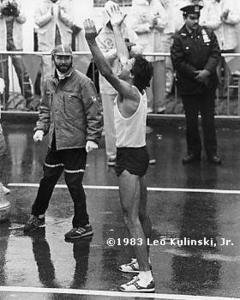 I had run the race of my life through the five boroughs of New York chasing the lead runners and finally catching the leader Geoff Smith from England with just 385 yards to the finish line. And so it is, if you focus all your energies to be the best that you can be, prepare and train to run the run of your “life” to complete what you started and finish, you are a winner!